Variable metabolic responses of Skagerrak invertebrates to low O2 and high CO2 scenarios Variable metabolic responses of Skagerrak invertebrates Aisling Fontanini et al. Coastal hypoxia is a problem that is predicted to increase rapidly in the future. At the same time, we are facing rising atmospheric CO2 concentrations, which are increasing the pCO2 and acidity of coastal waters. These two drivers are well studied in isolation; however, the coupling of low O2 and pH is likely to provide a more significant respiratory challenge for slow moving and sessile invertebrates than is currently predicted. The Gullmar Fjord in Sweden is home to a range of habitats, such as sand and mud flats, seagrass beds, exposed and protected shorelines and rocky bottoms. Moreover, it has a history of both natural and anthropogenically enhanced hypoxia as well as North Sea upwelling, where salty water reaches the surface towards the end of summer and early autumn. A total of 11 species (Crustacean, Chordate, Echinoderm and Mollusc) of these ecosystems were exposed to four different treatments (high or low oxygen and low or high CO2; varying pCO2 of 450 and 1300 µatm and O2 concentrations of 2–3.5 and 9–10 mg L−1) and respiration measured after 3 and 6 days, respectively. This allowed us to evaluate respiration responses of species of contrasting habitats to single and multiple stressors. Results show that respiratory responses were highly species specific as we observed both synergetic as well as antagonistic responses, and neither phylum nor habitat explained trends in respiratory responses. Management plans should avoid the generalized assumption that combined stressors will result in multiplicative effects and focus attention on alleviating hypoxia in the region. Fontanini, A., Steckbauer, A., Dupont, S., and Duarte, C. M.: Variable metabolic responses of Skagerrak invertebrates to low O2 and high CO2 scenarios, Biogeosciences, 15, 3717-3729, https://doi.org/10.5194/bg-15-3717-2018, 2018. Resolving the responses of marine organisms to the multiple pressures associated with global change is a major challenge for marine scientists (Duarte et al., 2014). This challenge is particularly pressing for coastal ecosystems, where human populations and impacts often concentrate. Among these pressures, decreasing O2 concentrations (hypoxia) and ocean acidification (OA) are receiving particular attention (Diaz and Rosenberg, 2008; Vaquer-Sunyer and Duarte, 2008; Doney et al., 2009; Kroeker et al., 2013). Whereas uptake of anthropogenic CO2, leads to a decreased pH in the open ocean (Caldeira and Wickett, 2003; Doney et al., 2009), explaining fluctuations of pH in coastal waters is more complex, often involving metabolic processes (Duarte et al., 2013). The involvement of metabolic processes in the regulation of pH in coastal waters is particularly evident when eutrophication stimulates algal blooms, leading to increased sedimentation of organic matter, subsequently degraded through microbial respiration, thereby consuming O2 and releasing CO2 (Conley et al., 2009). Hence, elevated pCO2 through excess respiration is associated with reduced O2 in coastal ecosystems, as these two gases are linked through metabolic processes. Indeed, hypoxia is affecting a growing number of coastal ecosystems (Diaz and Rosenberg, 2008; Vaquer-Sunyer and Duarte, 2008), suggesting that eutrophication-driven acidification (Borges and Gypens, 2010; Cai et al., 2011) should be spreading as well. Whereas scientists have acknowledged this coupling over decades, the impacts of these two pressures have continued to be studied in isolation, although the synergistic effect of O2 depletion and CO2 accumulation is likely to provide a significant challenge to coastal invertebrates and mostly to sessile species. Table 1Species used in the experiment, along with the habitat where they were collected and the characteristic pH and O2 levels in these habitats. Values of pH and O2 at the habitats are taken from Dorey et al. (2013), Hu et al. (2014) and Grans et al. (2014). The consequences of elevated pCO2 for marine organisms reach further than the highly documented impacts on calcification rates (Doney et al., 2009). For example, extracellular acid–base regulation is a challenge as some organisms are unable to compensate for increased environmental acidity (e.g. Pane and Barry, 2007), which may lead to elevated CO2 and low pH in their blood fluids. Depending on the severity of the pH change, organisms can experience mortality and a range of sub-lethal effects such as increased respiration, reduced growth, behavioural changes such as compromised ability to avoid predators (see summary by Kroeker et al., 2013) and increased susceptibility to parasites (Burgents et al., 2005). Similarly, hypoxia has been shown to cause mortality, reduced growth and reproduction, decrease respiration rates and induce behavioural changes such as forced migrations, which may make organisms more susceptible to predation (Vaquer-Sunyer and Duarte, 2008). In a review of 460 studies, half showed 50 % population mortality in response to low O2 that occurred within just five days (Vaquer-Sunyer and Duarte, 2008). There are growing concerns that the combined impacts of elevated pCO2 and hypoxia may prove to be a more significant challenge for marine life than the predictions from isolated effects (Burnett, 1997; Brewer and Peltzer, 2009; Mayol et al., 2012; Melzner et al., 2013). While other studies have considered combined stressors such as low O2 and high or low temperature (reviewed by Vaquer-Sunyer and Duarte, 2011), low O2 and increased hydrogen sulphide (reviewed by Vaquer-Sunyer and Duarte, 2010) or increased pCO2 and temperature (Doney et al., 2009; Lischka et al., 2011), research focusing on how elevated pCO2 and low O2 will impact marine organisms has been a recent focus (e.g. Gobler et al., 2014; Steckbauer et al., 2015; Sui et al., 2016a, b). For example, recent reports have shown that low O2 and elevated pCO2 can cause additive impacts for the growth and survivorship of bivalve larvae and later stage clams (Gobler et al., 2014); however, similar research indicates some early life stage bivalves are largely tolerant of these combined effects (Frieder et al., 2014). Moreover, invertebrates along the coastline of Chile show rather additive than synergetic affects to the combination of low O2 and elevated pCO2 (Steckbauer et al., 2015). Here we examine the independent and synergistic impacts of short-term elevated pCO2 and low O2 scenarios on the respiration of Skagerrak marine invertebrates at projected future levels, as down-regulation of metabolic rates has been proposed as a short-term evolutionary strategy to balance energy supply and demand when physiological processes are impaired by environmental stresses (Calosi et al., 2013). Elevated pCO2 and low O2 impose a significant strain on aerobic animals as the available energy acquired from oxic respiration can be reduced in the presence of increased pCO2 (Brewer and Peltzer, 2009). This energy could otherwise be directed towards growth, reproduction and other biologically and ecologically important activities. Reduced respiration is known to occur during hypoxia and both increases and decreases have been observed when pH is reduced (e.g. Whiteley, 2011; Wei and Gao, 2012). 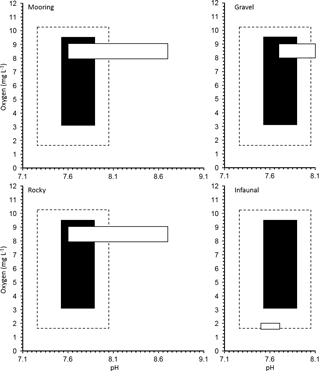 However, responses are often highly species-specific (Fabry, 2008; Malakoff, 2012; Calosi et al., 2013). Reduced metabolism is a beneficial response for organisms in the short-term but could become problematic over extended periods (Melzner et al., 2009; Rosa et al., 2013), as they may be unable to produce the energy required to support key processes. We evaluated the respiratory responses of 11 species of Skagerrak marine invertebrates representing four phyla and contrasting habitats, such as shallow rocky shores, typically growing in Baltic waters, and deeper (about 30 m), muddy sediments in Atlantic waters, as well as behavioural strategies, including sessile (e.g. blue mussels) and mobile (e.g. hermit crab, sea stars and sea snails; see Table 1). We used a two-way full factorial design enabling us to resolve additive and interactive effects. We hypothesize that responses could be driven by phyla and/or the habitat or niche the species occupy (Table 1). In particular, we expect all species to be able to cope with elevated pCO2, as they experience broad fluctuations of pCO2 in their habitat (Table 1), but should be vulnerable to hypoxia, as they experience high O2 levels in their habitat, except for those with an infaunal growth habitat, which are expected to be resistant to low O2 and elevated pCO2, as in their habitat (Table 1). We also expect calcifiers to be particularly vulnerable to elevated pCO2 as additional energy to support calcification is required to cope with the reduced saturation state of carbonate minerals associated with elevated pCO2 (Hendriks et al., 2015). The experiments were conducted during August 2013 at the Sven Lovén Centre for Marine Sciences in Kristineberg, of the University of Gothenburg, Sweden (58∘14′58′′ N, 11∘26′44′′ E). The centre provided access to a diversity of marine life as it is located at the mouth of the Gullmar Fjord. This fjord is home to a mix of habitats with varying complexity and a salinity gradient of three distinct water masses: (1) the surface layer from the Kattegat Sea (salinity 24–27); (2) the more saline mid-waters (32–33) from the Skagerrak; and (3) the salty (34.4) North Sea water mass in the deeper sections of the fjord (Polovodova et al., 2011). The fjord is home to a range of habitats such as sand and mud flats, seagrass beds, exposed and protected shorelines and rocky bottoms, which together with the diversity of water masses results in high biodiversity (Sven Loven Centre, 2011). Natural and anthropogenically enhanced hypoxia both occur within the fjord when enrichment is high and seasonal water exchange over the sill is slow (Josefson and Widbom, 1988; Arneborg, 2004). Specimens from 11 invertebrate species (Table 1) were collected from either surface or deep water within the Gullmar Fjord. Ciona intestinalis and Littorina littorea were collected by hand from mooring ropes and rocky shores in the Grunsund boat harbour, respectively. Asterias rubens was also collected by hand from the rocky shore at the research station. All other specimens were retrieved with an Agassiz trawl aboard the research vessel Oscar von Sydow at up to 30 m depth over both rocky bottom and muddy sediment. Amphuira filiformis were collected with a 0.5 m sediment grab at 20 m depth. Only the top 10 cm of sediment from each grab was retained, as this was the oxygenated layer where organisms could be found. All organisms were maintained in flow-through tanks water for at least two days before being placed into experimental aquaria. Water conditions followed the natural fluctuations occurring in the fjord (average pH ∼ 8.0, salinity = 32.1 ± 0.02 ranging from 31.5 to 32.7, and temperature = 16 ∘C ± 0.06 ranging from 14.1 to 17.3 ∘C, data from http://www.weather.loven.gu.se/en/data, last access: 2 October 2013). Based on earlier experience in holding these species for experimental purposes, Pagrus bernhardus was fed, by allowing them to feed ad libidum on blue mussel meat, while being held in the tank prior to the experiment. No animals were fed during the experimental period. C. intestinalis and L. littorea were placed in plastic mesh cages (∼ 0.5 cm2) so that they were not lost through the outflow or escaped the aquarium. All gastropods, bivalves and hermit crabs were cleaned with a toothbrush prior to use in order to remove any algae that could alter O2 concentrations during measurements. Invertebrates were exposed to one of the four treatments for a maximum of six days. Mortality events were rare across species (7 individuals died out of 168 used in the experiments) and insufficient to allow robust calculations of mortality rates. Of these seven, three specimens (one each of P. bernhardus, P. miliaris and A. rubens) died at the same time in the same aquarium indicating that there was likely an anomaly in the tank, although we could not determine its nature. The other four specimens that experienced mortality were A. rubens under LO2LCO2, and P. bernhardus, M. edulis, and A. filiformis under LO2HCO2. Survivorship in the control was 100 %, 97.6 % in LO2LCO2, and 92.9 % in the HO2HCO2 and LO2HCO2 treatment. Four treatments (three replica aquaria each) with two levels of dissolved oxygen (DO) and pCO2 concentration were used: (a) HO2LCO2 – ambient pCO2 (400 µatm) and high O2 (100 % saturation or 9–10 mg L−1); (b) LO2LCO2 – ambient pCO2 and reduced O2 (20–35 % saturation or 2–3.5 mg L−1); (c) HO2HCO2 – elevated pCO2 (∼ 1300 µatm) and high O2; and (d) LO2HCO2 – elevated pCO2 and reduced O2. The high O2 aquaria were bubbled with ambient air, whereas the low O2 aquaria were bubbled with a mixture of air and N2 using an Aalborg GFC17 Mass Flow Controller (MFC) and a jar filled with glass marbles (allowing even mixing of gases) to create a mixture with reduced O2 content. This was then bubbled through the six low O2 treatments maintaining the DO between 2.0–3.5 mg L−1, which was chosen after the meta-analysis of Vaquer-Sunyer and Duarte (2008) to be a bit higher than the traditional definition of hypoxia by Diaz and Rosenberg (1995, 2008). The DO content of each aquaria was measured daily with PresSens oxygen micro-optodes (OXY 4 v2.11 Micro) that were calibrated in O2 saturated deep-sea water (∼ 10 mg DO L−1 for 100 % DO) and a 1 g mL−1 sodium sulphite solution (0 mg DO L−1 for 0 % DO). To increase the pCO2, pure CO2 was bubbled through elevated pCO2 treatment aquaria. The low O2 treatments also received CO2 gas to maintain pCO2 at an ambient level due to the displacement of CO2 in the presence of N2. A reduction of 0.4 pH units (equivalent to 1300 µatm for elevated pCO2) from the ambient waters (at ∼ 450 µatm in low CO2) was chosen. These values correspond to the annual average atmospheric pCO2 level for the high-end projected level for 2100 (IPCC, 2007) and for 2005, respectively. The pH was controlled with Aqua Medic pH computers and 2.5 W M-ventil valves. Each pH controller had a sensor attached to the aquarium, which opened the valve to release a burst of CO2 when the pH was increasing beyond the set level (i.e. 7.6 or 8.0). The pHNBS (NBS scale) was measured daily in all aquaria with a Metrohm 827 pH meter, calibrated at 15 ∘C (with pH solutions of 3.99, 7.04, and 9.08). Aquaria were continuously replenished by allowing water to flow through the tanks (filtered through a 20 µm mesh) in a flow-through system with aquaria volume maintained at 17 L. Each replica aquaria held one individual from each species with the exception of C. intestinalis and L. littorea, which had two individuals per replica tank. The Gran titration method was used to measure total alkalinity (TA) every third day. Two 25 mL water samples were collected from each aquarium and filtered through a 45 µm filter. TA was measured at room temperature with a SI Analytics TitroLine alpha plus machine and TitriSoft 2.6 software. Spectrophotometry was used to measure the pHTOT (total scale) at 25 ∘C of treatments with a Perkin Elmer Lambda 25 UV/VIS spectrometer and Perkin Elmer UV WinLab software to confirm the values of the daily pHNBS measurements (after Dickson, 2009). TA, pHNBS, with temperature and salinity, were used to calculate the pCO2, and aragonite and calcite saturation states (Ωarag and Ωcal respectively) in CO2SYS (Pierrot and Wallace, 2006) with K1 and K2 constants from Mehrbach et al. (1973; refit by Dickson and Millero, 1987) and KSO4 from Dickson (1990). where RI ≤ 0 corresponds to the thermodynamic aerobic limit, a formal dead zone; at RI = 0 to 0.4 aerobic respiration does not occur; the range RI = 0.4 to 0.7 represents the practical limit for aerobic respiration, and the range RI = 0.7 to 1.0 delimits the aerobic stress zone (Brewer and Peltzer, 2009). Therefore, an RI less than 1.0 represents conditions in which organisms experience a physiological constraint on the free energy available to them to do work, with increasing severity of this constraint as the RI declines. Respiration was measured on day 3 and 6 of exposure (with the exception of O. nigra and C. intestinalis which were recorded on days 2 and 4, and 3 and 5, respectively) to detect any change in metabolic rate in response to short-term hypoxia, elevated pCO2 water or both. Invertebrates were placed in pre-treated water for approximately 5 h (depending on their size) in hermetically sealed containers. DO was measured at the beginning and end of the incubation (max. 5.5 h) using the PresSens micro-optodes. A blank sample was measured to see if there was any natural “drift”. Initial and final measurements were used to calculate the consumption rate standardized to dry weight (DW) as DO mg L−1 min−1 g DW−1. DW was measured after placing the individuals in the dry oven at 60 ∘C for at least 24 h to remove any moisture. All weight measurements were recorded with a Mettler Toledo AT261 Delta Range analytical balance (readability 0.01 mg). where XE and XC are the mean values of the response variable in the experimental and control treatments, respectively, where the control treatment was represented by the HO2LCO2 treatment. Bias-corrected bootstrapped 95 % confidence interval was calculated after Hedges et al. (1999) and Gurevitch and Hedges (1999). The zero line indicates no effect, and significance of mean effects is determined when the 95 % confidence interval does not overlap zero. Table 2Realized carbonate chemistry and oxygen concentrations for the four treatments (HO2LCO2, LO2LCO2, HO2HCO2, and LO2HCO2). Values are averages ±SE of measurements and calculations (using CO2SYS). Respiration Index (RI) as defined by Brewer and Peltzer (2009) (see Sect. 2.4 for details). One-way ANOVA's were conducted to test for differences in the respiration rate between treatments for each species. As there was no significant difference between time (i.e. difference between day 3 and 6) all data from day 3 and 6 were pooled together. Where the respiration showed significant differences between treatments, a Student's t test and post hoc Tukey HSD test were conducted to resolve which treatments resulted in different respiration rates. A regression comparison was done to test the overall differences between the treatments. Moreover, a general linear model (GLM) was used to quantify species response to changes in pCO2, oxygen and their interaction. A significant, positive interaction term indicates synergistic effects between the stressors, while a significant, but negative interaction term implies antagonistic effects, using the statistical software JMP (version 10.0; https://www.jmp.com, last access: 5 November 2012) with the level for significance set at 0.05. The average measurements and calculated carbonate chemistry data for the experimental period are shown in Table 2. On average (±SE) the targeted pH levels of 8.04 ± 0.07 in low pCO2 treatments and 7.59 ± 0.02 in the elevated pCO2 treatments were achieved, respectively, and significantly different from each other (p < 0.0001, ANOVA). The corresponding atmospheric CO2 levels were higher than our expected target of 380 µatm (HO2LCO2 and LO2LCO2) and 1300 µatm (HO2HCO2 and LO2HCO2). 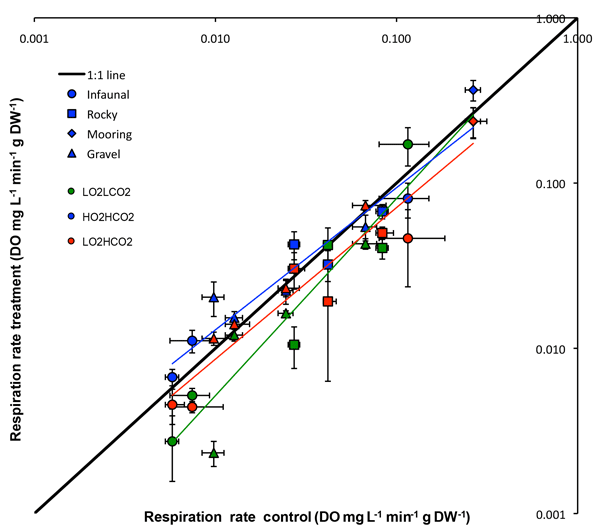 Figure 1Respiration rate (Average ±SE) control vs. treatments of all tested species: green – LO2LCO2 (y = 0.9571x− 0.0046, R2= 0.90), blue – HO2HCO2 (y = 1.2905x− 0.0122, R2= 0.93) and red – LO2HCO2 (y = 0.8301x− 0.0032, R2= 0.92). The 1:1 line represents where treatment metabolism is equal to ambient metabolism. Figure 2The Ln effect size of the response ratios for invertebrate species and phyla in response to three treatments: low O2 (LO2LCO2), low pH (HO2HCO2) and coupled low O2 and low pH (LO2HCO2) compared to control levels (HO2LCO2). LnRR = ln(treatment)–ln(control) ± Bias-corrected bootstrapped 95 % confidence interval (after Gurevitch and Hedges, 1999; Hedges et al., 1999; Kroeker et al., 2010). The zero line indicates no effect, and significance of mean effects is determined when the 95 % confidence interval does not overlap zero (significant results marked with “*”). Grey background was added to summarize the species by phyla. The desired average (±SE) O2 content of 9.51 ± 0.05 mg L−1 for high O2 treatments and 2.98 ± 0.15 mg L−1 for low oxygen treatments were also attained (Table 1; p < 0.0001, ANOVA). O2 concentrations remained relatively stable for the HO2LCO2 and HO2HCO2 treatments (SE = 0.06 for both), where 100 % saturation was targeted. DO concentrations in the LO2LCO2 and LO2HCO2 treatments were more variable ranging from 1.81 up to 3.88 mg L−1 over the course of the experiment. The pH was also most variable where manipulation was required in the HO2HCO2 (SD = 0.08 units) and LO2HCO2 (SD = 0.09 units) treatments; however, there was also natural variation in the seawater as seen in the HO2LCO2 and LO2LCO2 treatments (SD = 0.28). Overall pH and O2 levels were well maintained around the targeted averages. The RI averaged 1.60 ± 0.02 for the HO2LCO2, 1.15 ± 0.03 for the LO2LCO2, 1.14 ± 0.03 for the HO2HCO2 and 0.69 ± 0.04 for the LO2HCO2 treatment (Table 2). The RI values for the hypoxic and elevated pCO2 treatment were similar, as the differences in pO2 and pCO2 had a similar effect on RI. All treatments matched the target values and were held to an acceptable level and variability within each treatment (Table 2). Although the overall response was not significant for any experimental treatment (p= 0.357; ANOVA), when plotting the mean respiration rate of each species of the HO2LCO2 treatment vs. the different experimental treatments (Fig. 1), results of regression analysis show that there is a significant difference between the 1:1 line in the HO2HCO2 treatment (p < 0.05; regression comparison), whereas the other two treatments did not differ significantly (LO2LCO2: p= 0.701; LO2HCO2: p= 0.070; regression comparison). When comparing results of the different habitats a significant difference between treatments and habitats was observed (p < 0.01; two-way ANOVA), as the result the mooring was different from the other three habitats throughout treatments (Student's t). The general trend for the LO2LCO2 and LO2HCO2 treatment was for organisms to reduce their metabolism, as metabolic rates for most species fell below the 1:1 line (Fig. 1). The metabolic rate for C. intestinalis under ambient conditions was over 2.5 times greater than that for any other species. Echinoderms generally displayed lower respiration rates, with the exception of A. filiformis who had comparatively high metabolism (Fig. 2). 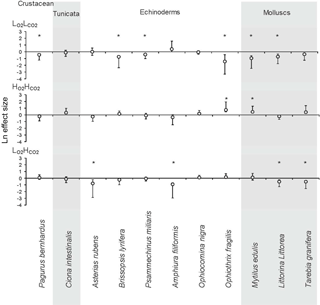 The three species of molluscs had similar metabolic rates, which differed amongst treatments. Table 3Respiration Rate in DO mg L−1 min−1 g DW−1 (±SE) and results of the general linear model (GLM) of all tested species (pooled data where we had data from different days). Levels not connected by the same letter are significantly different (after Student's t and Tukey HSD tests). Numbers written in bold colour highlight significant differences. When looking at the Ln effect size of each species separately, 6 of the 11 species tested experienced reduced respiration in response to the LO2LCO2 treatment compared to the HO2LCO2 treatment, with a further three species experiencing a trend towards reduced respiration (Fig. 2; Table 3). The species A. filiformis and A. rubens responded with increased respiration, although not significantly (Fig. 2). As for the HO2HCO2, six species increased respiration, with a significant difference in O. fragilis and M. edulis. The other five species responded with decreased metabolic rates (Fig. 2). The LO2HCO2 treatment also had quite variable results with seven species experiencing lower respiration rates than the control, with significant differences in the species A. rubens, A. filiformis, L. littorea and T. granifera (Fig. 2). The majority of species exposed to LO2LCO2, HO2HCO2 and LO2HCO2 did not experience changes in respiration that differ significantly from those observed under HO2LCO2 conditions. This is confirmed by the results of the GLM (Table 3), which showed that the responses to oxygen and CO2 are highly species specific, as we observed synergetic effects in only 4 out of 11 species (O. fragilis, O. nigra, A. rubens and T. granifera; Table 3). Figure 3Realized oxygen concentration and pH conditions for a manipulation experiment for 11 invertebrate species from four different natural habitats in the Gullmar Fjord: gravel, infaunal, mooring and rocky. Average and extreme (maximum and minimum) O2 and pH conditions during experimental exposure are shown in black and with dotted line, respectively. The natural O2 and pH conditions expected for each habitat are shown in the white boxes. The Baltic species tested were highly resistant to short-term hypoxia and elevated pCO2, alone or in combination, as they experienced very high survival rates across treatments in the relatively short-duration experiment reported here. Whereas lethal responses to elevated pCO2 are seldom observed (Kroecker et al., 2013), the level of hypoxia imposed is sufficient to cause mortality of half of the populations of most marine species (Vaquer-Sunyer et al., 2008), with elevated pCO2 expected to enhance respiratory stresses (Brewer and Peltzer, 2009). 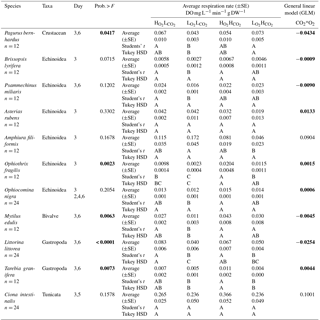 This suggests that the species tested have adapted to hypoxia and elevated pCO2, which are experienced regularly in the ecosystem (Table 1), as more vulnerable species would already have been removed from the community. The resistance of all species tested to short-term (up to 6 day exposure) hypoxia, elevated pCO2 and their combined effects, reflected in negligible mortality rates and modest metabolic responses, suggest that the community in the Gullmar Fjord have already been sieved to contain species and lineages resistant to these stressors, to which they have been exposed, at least for short periods of time, for generations (Josefson and Widbom, 1988; Arneborg, 2004). Whereas physiological limits to low O2 concentrations seem unavoidable (Brewer and Peltzer, 2009), the existence of thresholds for elevated pCO2 are less evident. 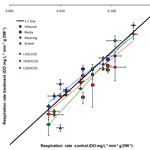 Moreover, the fact that no or negligible mortality was experienced in our experiments at RI's of 0.69, where Brewer and Peltzer (2009) predict the organisms to be severely compromised, in the thermodynamic limit of aerobic respiration, supports the idea that organisms have acclimatized to reoccurring events of low O2 (and low pH), which are well documented within the Gullmar Fjord (Rosenberg, 1985; Johannessen and Einar, 1996; Nordberg et al., 2000; Polovodova and Nordberg, 2013). While there is a relatively long history of monitoring in the Gullmar Fjord, one of the longest-studied ecosystems in the world (seawater temperature records exist since the 1700s), pH data collection has been erratic and often only recorded at the surface (SMHI, 2011). However, available data shows pH has fluctuated between 7.6 and 8.7 over the last six decades (Dorey et al., 2013). Our experimental treatments explored a more limited range of O2 and CO2 than present across Gullmar Fjord. The community in this area has already been sieved of species vulnerable to low O2 concentrations due to a history of hypoxia and even complete anoxia within the last four decades (Nordberg et al., 2000; Polovodova et al., 2011). Indeed, our HO2LCO2 values, involving saturating O2 concentrations, are unlikely to be experienced at the fjords depths (Fig. 3). It is, therefore, possible that the low O2 conditions better represented the environment in which the organisms were growing prior to the experiments. The experimental CO2 values tested need also be compared with ambient levels. Dorey et al. (2013) found that pH in the Gullmar Fjord fluctuated as much as 8.7 to 7.6 over the last 66 years (average monthly fluctuation was 0.34 to 0.89 units). Therefore, the minimum pH level conducive to a rise in pCO2 to 1,000 µatm would be closer to 7.2. Dorey et al. (2013) conducted lab experiments with pH values as low as 6.5 for urchin larvae, which are generally more sensitive to pH change than adults (Dupont and Thorndyke, 2009). Exposed A. filiformis live in sediment burrows that experience much lower oxygen and higher pCO2 than surrounding water which intensifies with depth (Hu et al., 2014). A. filiformis have been shown to withstand a pH of 7.0 and O2 levels below 2.0 mg L−1 and experience no mortality (Hu et al., 2014). Hence, the species tested here already has O2 and pH values comparable to those used as treatments here, particularly for infauna, such as A. filiformis and B. lyrifera which appear to be exposed to low O2 and pH conditions on a regular basis. Sublethal responses, in terms of metabolic depression or enhancement, were observed in response to hypoxia and elevated pCO2, alone or in combination. We expected that LO2HCO2 would be the most significant respiratory stress for organisms, as it would affect all species except those with an infaunal growth habit, and thus would result in a reduced metabolism. However, only one species (A. filiformis) with an infaunal growth habit (Table 1) experienced a significantly reduced metabolism due the coupled impacts of HCO2 and LO2. Two of the three species with an infaunal growth habit showed no metabolic response to hypoxia, whereas all except two of the species growing in other habitats, generally experiencing high O2 levels, experienced a metabolic depression under hypoxia. Whereas there were no consistent patterns in the responses across phyla, they showed consistency among habitats, reflecting the conditions the species were adapted to in their natural habitat. There is growing interest in understanding the response of marine organisms to multiple stressors, such as rising temperature, OA, increased UVB radiation and reduced O2 (e.g. Pörtner et al., 2005; Fredersdorf et al., 2009; Vaquer-Sunyer and Duarte, 2010, 2011; Duarte, 2014). For example, Mayol et al. (2012) examined the co-occurrence of low O2 with elevated pCO2 in the Pacific Ocean off the Chilean coast, identifying layers where both stressors co-occur. Yet, most experimental evidence of the response of marine invertebrates to stressors focuses on individual effects, where their combined effects may differ from those derived (or calculated) from combinations of individual effects (cf. in Kroeker et al., 2013). Indeed, multiplicative, rather than additive, effects of the impacts of the individual stresses are expected (Pörtner et al., 2005; Clapham and Payne, 2011; Ateweberhan et al., 2013). However, our results demonstrate that there is a broad range of possible impacts within species from the Gullmar Fjord ecosystem, including species that show an amplification of the responses beyond that expected under an additive model and those that show a buffering or compensation of responses when multiple stressors co-occur. The A. rubens exhibited a synergistic response to hypoxia and elevated pCO2 as it showed a significant metabolic depression under both stressors, but no significant response to either one alone. The echinoderm O. fragilis experienced enhanced metabolic rates when exposed to elevated pCO2, consistent with the sensitivity to high CO2 reported for their larvae, which experienced 100 % mortality when pH was reduced by just 0.2 units (Dupont and Thorndykee, 2008). In contrast, M. edulis experienced depressed metabolism when exposed to hypoxia. As a result, these effects operated into an antagonistic mode, resulting in no significant change in metabolic rates when the organisms were exposed to both hypoxia and elevated pCO2. However, there was no general trend for responses to be either additive or synergistic across species. Indeed, our result suggests that responses are mostly dependent on the fluctuations in the stressors in their habitats, so that the prior selective and adaptive history of the species plays an important role in determining their vulnerability to different stressors. Whereas a theoretical framework to predict the response of marine organisms to multiple stressors is generally lacking, Brewer and Pelzer (2009) derived a theoretical expectation of the expected responses in the particular case of combined hypoxia and high CO2, the organisms tested show a RI decrease with intensity of alterations in our treatments as expected. Although we reached the 0.7 threshold value (0.69 under LO2HCO2), which represents the thermodynamic limit for aerobic respiration, the organisms are expected to be severely compromised. Yet, we observed little or no mortality and the organisms exposed to LO2HCO2 should have experienced aerobic stress, yet our results showed that they were more likely to reduce respiration under hypoxia. Hence, the RI does not appear to hold predictive power as to the response of marine invertebrates to the interactions between O2 and CO2. All but one of the tested species were calcifiers, and were expected to be impacted by elevated pCO2. Indeed, the treatments with elevated pCO2 reached an undersaturated concentration of aragonite (Ωarag < 1), where calcifiers are expected to be stressed (Doney et al., 2009). Molluscs rely chiefly on aragonite to construct their shells (Porter, 2007), while echinoderms and crustaceans use calcite (Raup, 1959; Raabe et al., 2005). Yet, the impacts of elevated pCO2 were not greater in molluscs than for echinoderms and crustaceans in our experiments. Hence, the RI does not hold predictive power on the effects of hypoxia and/or pCO2 on the species tested here, which seemed best predicted from consideration of the ranges of O2 and CO2 they experience in their habitat. Responses to low O2 and elevated pCO2 were variable amongst phyla and species in the community tested here, ranging from antagonistic to synergistic responses. The very limited impacts of low O2 and elevated pCO2 of the invertebrates from this ecosystem, which showed little or no mortality in the presence of both stressors, reflects the range of conditions in the habitats these organisms occupy. This ecosystem has been reported to experience recurrent seasonal hypoxic events characterized by low pH values and elevated pCO2 (Nordberg et al., 2000; Dorey et al., 2013). Hence, the organisms tested were resistant to both stressors within the levels used in this experiment, which, while ranging within values reported to negatively impact on marine invertebrates for both O2 (Vaquer-Sunyer and Duarte, 2008) and CO2 (Kroeker et al., 2013), were within the range present in their ecosystem. Eutrophication-driven hypoxia, such as that experienced in Baltic fjords, derives from excess metabolic O2 consumption and is, therefore, coupled with elevated pCO2 (e.g. Duarte et al., 2013; Melzner et al., 2013; Wallace et al., 2014). Hence, low O2 and elevated pCO2 often co-occur in areas affected by hypoxic events, such as Gullmar Fjord. Haselmair et al. (2010) observed that pH declined by up to 0.7 units during an induced anoxic event in the Adriatic Sea and Melzner et al. (2013) predict that pCO2 can reach up to 3200 µatm during anoxic events in brackish waters (salinity of 20), with those values decreasing as salinity increases. Hence, adaptive responses of organisms in the Gullmar Fjord should be coupled for low O2 and elevated pCO2, thereby accounting for the limited effects to the experimentally imposed stressors used here. Respiratory responses to low O2 and elevated pCO2 were variable amongst phyla and species in the community tested here, ranging from buffered to amplified metabolic responses. The very limited impact of low O2 and elevated pCO2 of the invertebrates from this ecosystem, which showed little or no mortality in the presence of both stressors, reflects the past history of this ecosystem, which has been reported to experience recurrent hypoxic events characterized by low pH values and elevated pCO2 (Nordberg et al., 2000; Dorey et al., 2013). Hence, the organisms trialled were resistant to both stresses within the levels used in this experiment, which were within values reported to negatively impact on marine invertebrates for both O2 (Vaquer-Sunyer and Duarte, 2008) and CO2 (Kroeker et al., 2013). Therefore, hypoxia impacted the greatest number of organisms and represents the most concerning stress in the region. Management plans addressing hypoxia should also avoid the generalized assumption that synergistic stressors will result in multiplicative effects, and focus research into understanding the mechanisms calcifiers and other invertebrates employ to cope with these changes. Our results also highlight the idiosyncratic nature of responses, which were strongly species-specific, suggesting that extrapolations from experiments conducted on a few species to the phylum level may be strongly misleading. This adds complexity to the challenge of predicting how global stressors will affect marine ecosystems in the future. Data can be accessed at https://doi.org/10.1594/PANGAEA.890918 (Fontanini et al., 2018). The experiment was designed by AF, AS and CMD. The experiment was conducted by AF, AS and SD. The analysis was conducted by AF, AS, SD and CMD. The writing was performed by AF, AS, SD and CMD. This research was funded by the project ASSEMBLE (grant agreement no. 227799; under the EU Research Infrastructure Action FP7) and the Estres-X project funded by the Spanish Ministry of Economy and Competitiveness (CTM2012-32603). Aisling Fontanini was funded by the School of Plant Biology at the University of Western Australia (grant 10300374) and Alexandra Steckbauer was funded by a fellowship from the Government of the Balearic Islands (Department on Education, Culture and Universities) and the EU (European Social Fund) as well as King Abdullah University of Science and Technology. Sam Dupont is funded by the Linnaeus Centre for Marine evolutionary Biology at the University of Gothenburg and supported by a Linnaeus grant from the Swedish research Councils VR and Formas. We thank Karen Chan, Pia Engström and Julia Dombrowski for their assistance. Arneborg, L.: Turnover times for the water above sill level in Gullmar Fjord, Cont. Shelf Res., 24, 443–460, https://doi.org/10.1016/j.csr.2003.12.005, 2004. Ateweberhan, M., Feary, D. A., Keshavmurthy, S., Chen, A., Schleyer, M. H., and Sheppard, C. R. C.: Climate change impacts on coral reefs: Synergies with local effects, possibilities for acclimation, and management implications, Mar. Pollut. Bull., 74, 526–539, https://doi.org/10.1016/j.marpolbul.2013.06.011, 2013. Borges, A. V. and Gypens, N.: Carbonate chemistry in the coastal zone responds more strongly to eutrophication than to ocean acidification, Limnol. Oceanogr., 55, 346–353, https://doi.org/10.4319/lo.2010.55.1.0346, 2010. Brewer, P. and Peltzer, E.: Limits to Marine Life, Science, 324, 347–348, https://doi.org/10.1126/science.1170756, 2009. Burgents, J. E., Burnett, K. G., and Burnett, L. E.: Effects of hypoxia and hypercapnic hypoxia on the localization and the elimination of Vibrio campbellii in Litopenaeus vannamei, the Pacific white shrimp, Biol. Bull., 208, 159–168, 2005. Burnett, L.: The challenges of living in hypoxic and hypercapnic aquatic environments, Am. Zool., 37, 633–640, 1997. Cai, W., Hu, X., Huang, W., Murrell, M. C., Lehrter, J. C., Lohrenz, S. E., and Gong, G.: Acidification of subsurface coastal waters enhanced by eutrophication, Nat. Geosci., 4, 766–770, https://doi.org/10.1038/ngeo1297, 2011. Caldeira, K. and Wickett, M.: Anthropogenic carbon and ocean pH, Nature, 425, 365, https://doi.org/10.1038/425365a, 2003. Calosi, P., Rastrick, S., Lombardi, C., de Guzman, H. J. Davidson, L., Jahnke, M., Giangrande, A., Hardege, J. D., Schulze, A., Spicer, J. I., and Gambi, M. C.: Adaptation and acclimatization to ocean acidification in marine ectotherms: an in situ transplant experiment with polychaetes at a shallow CO2 vent system, Philos. T. R. Soc. B, 368, 1–15, https://doi.org/10.1098/rstb.2012.0444, 2013. Clapham, M. E. and Payne, J. L.: Acidification, anoxia, and extinction: A multiple logistic regression analysis of extinction selectivity during the Middle and Late Permian, Geology, 39, 1059–1062, https://doi.org/10.1130/G32230.1, 2011. Conley, D. J., Carstensen, J., Vaquer-Sunyer, R., and Duarte, C. M.: Ecosystem thresholds with hypoxia, Hydrobiologia, 629, 21–29, https://doi.org/10.1007/s10750-009-9764-2, 2009. Diaz, R. and Rosenberg, R.: Marine Benthic Hypoxia: A review of its ecological effects and the behavioural responses of benthic macrofauna, Oceanogr. Mar. Biol., 33, 245–303, 1995. Dickson, A. G. and Millero, F. J.: A comparison of the equilibrium constants for the dissociation of carbonic acid in seawater media, Deep-Sea Res. Pt. I, 34, 1733–1743, 1987. Dickson, A. G.: Standard potential of the reaction: AgCl(s) + 1/2H2(g) = Ag(s) + HCl(aq), and the standard acidity constant of the ion HSO4- in synthetic sea water from 273.15 to 318.15 K, J. Chem. Thermodyn., 22, 113–127, 1990. Doney, S., Fabry, V., Feely, R., and Kleypas, J.: Ocean Acidification: The Other CO2 Problem, Annu. Rev. Mar. Sci., 1, 169–192, https://doi.org/10.1146/annurev.marine.010908.163834, 2009. Dorey, N., Lancon, P., Thorndyke, M., and Dupont, S.: Assessing physiological tipping point of sea urchin larvae exposed to a broad range of pH, Global Change Biol., 19, 3355–3367, https://doi.org/10.1111/gcb.12276, 2013. Duarte, C. M.: Global Change and the Future Ocean: A Grand Challenge for Marine Sciences, Front. Mar. Sci., 63, 1–16, https://doi.org/10.3389/fmars.2014.00063, 2014. Duarte, C., Hendriks, I., Moore, T., Olsen, Y., Steckbauer, A., Ramajo, L., Carstensen, J., Trotter, J., and McCulloch, M.: Is Ocean Acidification an Open-Ocean Syndrome? Understanding Anthropogenic Impacts on Seawater pH, Estuar. Coast., 36, 221–236, https://doi.org/10.1007/s12237-013-9594-3, 2013. Dupont, S. and Thorndyke, M. C.: Ocean acidification and its impact on the early life-history stages of marine animals, CIESM, Impacts of acidification on biological, chemical and physical systems in the Mediterranean and Black Seas, no. 36, in: CIESM Workshop Monographs, edited by: Briand, F., Monaco, 89–97, 2008. Fabry, V. J.: Marine Calcifiers in a High-CO2 Ocean, Science, 320, 1020–1022, https://doi.org/10.1126/science.1157130, 2008. Fontanini, A., Steckbauer, A., Dupont, S., and Duarte, C. M.: Metabolic responses of Skagerrak invertebrates to low O2 and high CO2 scenarios, and environmental characteristics during experiments at Kristineberg, Sweden, PANGAEA, https://doi.org/10.1594/PANGAEA.890918, 2018. Fredersdorf, J., Müller, R., Becker, S., Wiencke, C., and Bischof, K.: Interactive effects of radiation, temperature and salinity on different life history stages of the Arctic kelp Alaria esculenta (Phaeophyceae), Oecologia, 160, 483–492, https://doi.org/10.1007/s00442-009-1326-9, 2009. Frieder, C., Gonzalez, J., Bockmon, E., Navarro, M., and Levin, L.: Can variable pH and low oxygen moderate ocean acidification outcomes for mussel larvae?, Global. Change Biol., 20, 754–764, https://doi.org/10.1111/gcb.12485, 2014. 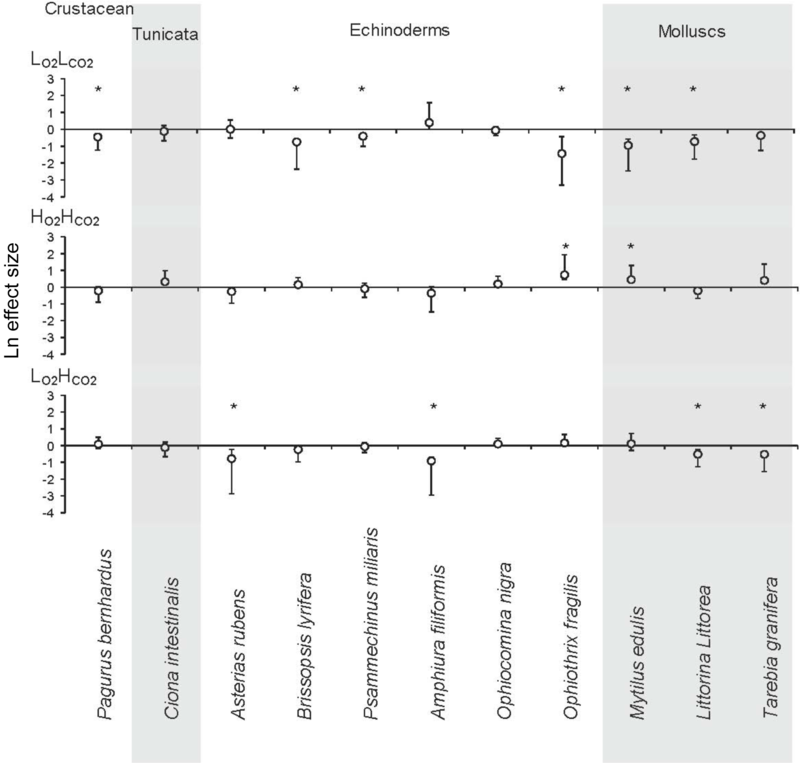 Gobler, C., DePasquale, E., Griffith, A., and Baumann, H.: Hypoxia and Acidification Have Additive and Synergistic Negative Effects on the Growth, Survival, and Metamorphosis of Early Life Stage Bivalves, PLoS ONE, 9, 1–10, https://doi.org/10.1371/journal.pone.0083648, 2014. Gurevitch, J. and Hedges, L. V.: Statistical issues in ecological meta-analyses, Ecology, 80, 1142–1149, 1999. Haselmair, A., Stackowitsch, M., Zuschin, M., and Riedel, B.: Behaviour and mortality of benthic crustaceans in response to experimentally induced hypoxia and anoxia in situ, Mar. Ecol. Prog. Ser., 414, 195–208, https://doi.org/10.3354/meps08657, 2010. Hedges, L. V., Gurevitch, J., Curtis, P. S., and Jun, N.: The Meta-Analysis of Response Ratios in Experimental Ecology, Ecology, 80, 1150–1156, 1999. Hendriks, I. E., Duarte, C. M., Olsen, Y. S., Steckbauer, A., Ramajo, L., Moore, T. S., and McCulloch, M.: Biological mechanisms supporting adaptation to ocean acidification in coastal ecosystems, Estuar. Coast. Shelf S., 152, A1–A8, https://doi.org/10.1016/j.ecss.2014.07.019, 2015. Hu, M. Y., Casties, I., Stumpp, M., Ortega-Martinez, O., and Dupont, S.: Energy metabolism and regeneration are impaired by seawater acidification in the infaunal brittlestar Amphiura filiformis, J. Exp. Biol., 217, 2411–2421, https://doi.org/10.1242/jeb.100024, 2014. IPCC: Climate Change 2007: The Physical Science Basis, Contribution of Working Group I to the Fourth Assessment Report of the Intergovernmental Panel on Climate Change, Cambridge University Press, Cambridge, UK, 2007. Johannessen, T. and Einar, D.: Declines in oxygen concentrations along the Norwegian Skagerrak coast, 1927–1993: A signal of ecosystem changes due to eutrophication, Limnol. Oceanogr., 41, 766–788, 1996. Josefson, A. and Widbom, B.: Differential response of benthic macrofauna and meiofauna to hypoxia in the Gullmar Fjord basin, Mar. Biol., 100, 31–40, https://doi.org/10.1007/BF00392952, 1988. Kroeker, K., Kordas, R., Crim, R., and Singh, G.: Meta-analysis reveals negative yet variable effect of ocean acidification on marine organisms, Ecol. Lett., 13, 1419–1434, https://doi.org/10.1111/j.1461-0248.2010.01518.x, 2010. Kroeker, K. J., Kordas, R. L., Crim, R. N., Hendriks, I. E., Ramajo, L., Singh, G. S., Duarte, C. M., and Gattuso, J.-P.: Impacts of ocean acidification on marine organisms: quantifying sensitivities and interaction with warming, Global Change Biol., 19, 1884–1896, https://doi.org/10.1111/gcb.12179, 2013. Lischka, S., Büdenbender, J., Boxhammer, T., and Riebesell, U.: Impact of ocean acidification and elevated temperatures on early juveniles of the polar shelled pteropod Limacina helicina: mortality, shell degradation, and shell growth, Biogeosciences, 8, 919–932, https://doi.org/10.5194/bg-8-919-2011, 2011. Malakoff, D.: Researchers Struggle to Assess Responses to Ocean Acidification Science, 338, 27–28, https://doi.org/10.1126/science.338.6103.27, 2012. Mayol, E., Ruiz-Halpern, S., Duarte, C., Castilla, J., and Pelegrí, J.: Coupled CO2 and O2-driven compromises to marine life in summer along the Chilean sector of the Humboldt Current System, Biogeosciences, 9, 1183–1194, https://doi.org/10.5194/bg-9-1183-2012, 2012. Mehrbach, C., Culberson, C. H., Hawley, J. E., and Pytkowicz, R. M.: Measurement of the Apparent Dissociation Constant of Carbonic Acid in Seawater at Atmospheric Pressure, Limnol. Oceanogr., 18, 897–907, 1973. Melzner, F., Gutowska, M. A., Langenbuch, M., Dupont, S., Lucassen, M., Thorndyke, M. C., Bleich, M., and Pörtner, H.-O. : Physiological basis for high CO2 tolerance in marine ectothermic animals: pre-adaptation through lifestyle and ontogeny?, Biogeosciences, 6, 2313–2331, https://doi.org/10.5194/bg-6-2313-2009, 2009. Melzner, F., Thomsen, J., Koeve, W., Oschlies, A., Gutowska, M. A., Bange, H. W., Hansen, H. P., and Kortzinger, A.: Future ocean acidification will be amplified by hypoxia in coastal habitats, Mar. Biol., 160, 1875–1888, https://doi.org/10.1007/s00227-012-1954-1, 2013. Nordberg, K., Gustafsson, M., and Krantz, A.-L.: Decreasing oxygen concentrations in the Gullmar Fjord, Sweden, as confirmed by benthic foraminifera, and the possible association with NAO, J. Marine Syst., 23, 303–316, 2000. Pane, E. F. and Barry, J. P.: Extracellular acid–base regulation during short-term hypercapnia is effective in a shallow-water crab, but ineffective in a deep-sea crab, Mar. Ecol. Prog. Ser., 334, 1–9, https://doi.org/10.3354/meps334001, 2007. Pierrot, D. L. E. and Wallace, D. W. R.: MS Excel Program Developed for CO2 System Calculations, ORNL/CDIAC-105a, Carbon Dioxide Information Analysis CeN, USA, 2006. Polovodova, A. and Nordberg, K.: Foraminiferal fauna from a deep basin in Gullmar Fjord: The influence of seasonal hypoxia and North Atlantic Oscillation, J. Sea Res., 79, 40–49, https://doi.org/10.1016/j.seares.2013.02.001, 2013. Polovodova, A., Nordberg, K., and Filipsson, H.: The benthic foraminiferal record of the Medieval Warm Period and the recent warming in the Gullmar Fjord, Swedish west coast, Mar. Micropaleontol., 81, 95–106, https://doi.org/10.1016/j.marmicro.2011.09.002, 2011. Porter, S. M.: Seawater Chemistry and Early Carbonate Biomineralization, Science, 316, 1302, https://doi.org/10.1126/science.1137284, 2007. Pörtner, H. O., Langenbuch, M., and Michaelidis, B.: Synergistic effects of temperature extremes, hypoxia, and increases in CO2 on marine animals: From Earth history to global change, J. Geophys. Res.-Oceans, 110, 1–15, https://doi.org/10.1029/2004JC002561, 2005. Raabe, D., Sachs, C., and Romano, P.: The crustacean exoskeleton as an example of a structurally and mechanically graded biological nanocomposite material, Acta Mater., 53, 4281–4292, https://doi.org/10.1016/j.actamat.2005.05.027, 2005. Raup, D. M.: Crystallography of Echinoid Calcite, J. Geol., 67, 661–674, https://doi.org/10.1086/626624 1959. Rosa, R., Trübenbach, K., Repolho, T., Pimentel, M., Faleiro, F., Boavida-Portugal, J., Baptista, M., Lopes, V., Dionisio, G., Leal, M. C., Calado, R., and Pörner, H. O.: Lower hypoxia thresholds of cuttlefish early life stages living in a warm acidified ocean, P. R. Soc. B, 280, 1–7, https://doi.org/10.1098/rspb.2013.1695 2013. Rosenberg, R.: Eutrophication – The future marine coastal nuisance?, Mar. Pollut. Bull., 16, 227–231, 1985. SMHI: Swedish Oceanographic Data Centre, Swedish Meteorological and Hydrological Institute, Gothenburg, Sweden, 2011. Steckbauer, A., Ramajo, R., Hendriks, I. E., Fernandez, M., Lagos, N., Prado, L., and Duarte, C. M.: Synergetic effects of hypoxia and increasing CO2 on benthic invertebrates of the central Chilean coast, Front. Mar. Sci., 2, 1–12, https://doi.org/10.3389/fmars.2015.00049, 2015. Sui, Y., Kong, H., Huang, X., Dupont, S., Hu, M., Storch, D., Pörtner, H.-O., Lu, W., and Wang, Y.: Combined effects of short-term exposure to elevated CO2 and decreased O2 on the physiology and energy budget of the thick shell mussel Mytilus coruscus, Chemosphere, 155, 207–216, http://www.ncbi.nlm.nih.gov/pubmed/27115845, last access: 1 May 2016a. Sui, Y., Kong, H., Shang, Y., Huang, X., Wu, F., Hu, M., Lin, D., Lu, W., and Wang, Y.: Effects of short-term hypoxia and seawater acidification on hemocyte responses of the mussel Mytilus coruscus, Mar. Pollut. Bull., 1–7, Elsevier Ltd. http://www.ncbi.nlm.nih.gov/pubmed/27207025, last access: 26 May 2016b. The Sven Lovén Centre for Marine Sciences: Kristineberg, available at: http://www.assemblemarine.org/the-sven-lov-n-centre-for-marine-sciences-kristineberg/, last access: 28 May 2018, 2017. Vaquer-Sunyer, R. and Duarte, C.: Thresholds of hypoxia for marine biodiversity, P. Natl. Acad. Sci. USA, 105, 15452–15457, https://doi.org/10.1073/pnas.0803833105, 2008. Vaquer-Sunyer, R. and Duarte, C.: Sulfide exposure accelerates hypoxia-driven mortality, Limnol. Oceanogr., 55, 1075–1082, https://doi.org/10.4319/lo.2010.55.3.1075, 2010. Vaquer-Sunyer, R. and Duarte, C.: Temperature effects on oxygen thresholds for hypoxia in marine benthic organisms, Global Change Biol., 17, 1788–1797, https://doi.org/10.1111/j.1365-2486.2010.02343.x, 2011. Wei, L. and Gao, K.: A marine secondary producer respires and feeds more in a high CO2 ocean, Mar. Pollut. Bull., 64, 699–703, https://doi.org/10.1016/j.marpolbul.2012.01.033, 2012. Whiteley, N.: Physiological and ecological responses of crustaceans to ocean acidification, Mar. Ecol. Prog. Ser., 430, 257–271, https://doi.org/10.3354/meps09185, 2011.